CN: Sensitive content, discussion about death, benefits, welfare reform and ableism. Attempting to study or work while having a disability or disabilities can be tough. Don’t get me wrong; your natural reaction shouldn’t be to feel pity or upset at the difficulties and challenges faced by myself. Instead: feel anger. Society isn’t designed to accommodate disabled people, and this is particularly true for the fields of work or study. Society just isn’t accessible for competing in the workplace. Universities have the potential to be one of the best institutions to help reduce those barriers in both work and study. They have the potential to shape and build a more accessible society, and ensure that a social model is adopted. They are, after all, an institution which is supposed to shape society. But the key word here is ‘potential’ – because this just isn’t currently happening in reality. The movement towards an inclusive society is a slow one in most areas, and even completely halted in others. There are certainly some people and some teams who are advocating for these changes and doing tremendous work to help move it forward, but unless it’s a collective fight, it will take much longer than necessary to achieve what we’re setting out to do. I became disabled back when I was about fourteen years old. My condition was idiopathic, so something which doesn’t have a known cause. For me, studying became considerably more difficult. My teachers were all great in supporting me and offering to put arrangements in place to make sure I did not suffer academically. But I knew then that the cause of those barricades was something deeper and much more embedded. Fast forward to University, I was studying for a Law Degree and still battling the same effects of my conditions, including chronic pain and chronic fatigue. Even though I was on a low contact-hours degree, I still had to sit in a lecture hall for two hours at a time, read complex textbooks while in agony, write essays when I couldn’t keep my eyes open, and still be expected to take part in the extra-curricular activities of the student experience, because I had to do these in order to be employable. Do you see the unfairness here? The academic world and the capitalist market combine, implicitly or explicitly, to make sure that disabled people are not granted entry to the higher echelons of success. It’s easy to look to the ‘success’ stories of people who have ‘overcome adversity’ and ‘inspired others in spite of their disabilities’. However, just remember why this is fundamentally problematic; it is designed to divert your anger to a place of sympathy, and to reassure your conscience that inaccessible systems and processes are morally permissible. Fast forward to the current setting where I’ve been working for just over fifteen months. I’m fortunate enough to work in a place that is very accommodating and very understanding of what my disability means and what I need in order to make sure I can meet the demands of the job. But being a Sabbatical Officer isn’t plain sailing – far from it. Student Officers are virtually expected to be in all places, at all times, and still reply to that email in a matter of minutes. It is 24/7 and there is no down time. Every student who walks through your door commands the entirety of your attention and you must put a smile on your face for every campaign. The rewards of the job are more than I could ever articulate, but I shouldn’t have to apologise or justify why the demands of the job mean that something has to give. The life of a Sabbatical Officer is something which also needs to change nationally. I am also repeatedly told that I have never had a ‘real job’. While I may fundamentally disagree with that analysis, let’s continue on the basis that I haven’t worked anywhere beyond the Students’ Union. When I move to a different job, I worry that nothing is going to change – the constant exhaustion, the lack of energy, the excruciating pain, and the permeating emotional and physical fatigue. Sure there’s the legal requirement for employers to make reasonable adjustments, but sometimes it is minimum standards which can actually do more harm than good. When I studied Employment Law at University, I came across a very interesting academic field of research whereby academics were analysing whether proactive or reactive reasonable adjustments were better. My initial viewpoint was to suggest that reactive was the better option; surely it made sense to implement reasonable adjustments which were individualised and specific to the needs and requirements of that person. It is person-centered and empowers them with the agency to vocalise what supports they need. Then, like any academic essay, I looked a little bit further and researched the opposite side of the argument. When proactive reasonable adjustments are put in place, it makes the workplace and society better for everyone. Minimum standards can therefore be cloaked in an air of complacency, that the box has been ticked, and everyone is on a level playing field. It made me think about this graphic, one which is very powerful at articulating the often varied struggles and barriers people face in order to fully participate in society. 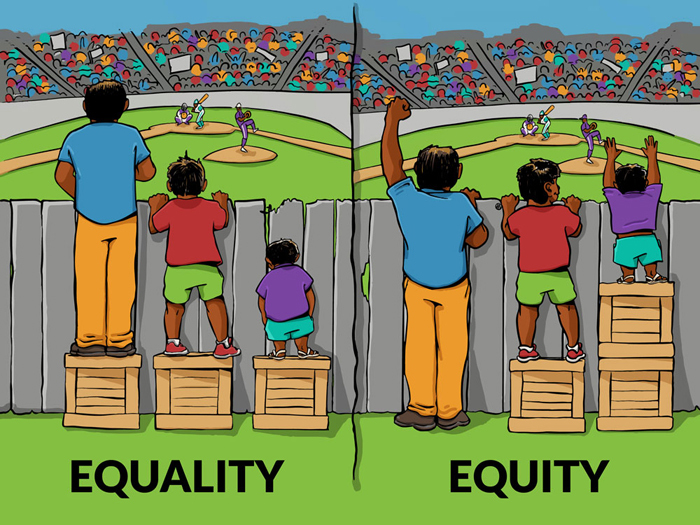 But even this cartoon is flawed; it suggests that with ‘Equity’ everything is fine, but ignores the fact that there are systemic injustices and inherent prejudices. In reality, the fence shouldn’t prevent anyone from seeing the game without assistances. The attitude towards disabled people in work, particularly in this modern age, is sickening. There is an automatic distrust of people who say they are disabled and can either not work, or work with reduced hours. There is a paranoia that disabled people are ‘cheating the system’, using their ‘supposed’ conditions to their advantage, and put their feet up just to enjoy their time off. This never accounts for the fact that the number of people who are genuinely abusing welfare claims is tiny. No one ever mentions the fact that the number of tax evaders is hundreds and hundreds of times larger. No one ever mentions the fact that this distrust is ideologically driven. When those in power impose austerity, impose cuts to welfare via ‘reforms’, and cause people to die via degrading and humiliating ‘fit to work’ assessments, that is because a conscious decision has been taken to attack the most vulnerable in society. Often, it is those who have little power, influence, or a voice to challenge the status quo. The Disable the Label Campaign is not just an awareness week; it’s not just a week of events and discussions; it’s a call for action and a rallying cry to mobilise and to support disabled people in their fight against struggle. But this isn’t individual struggle. Always remember that struggle is imposed by an oppressor, and always remember that oppressors can be defeated.